5.0 out of 5 starsExciting! This was the actual book I was looking for when I ordered the comic one. YES!!! Im excited! Thank You, Naomi P.
While the book itself is an enjoyable read if you look at it with today's values, it has completely destroyed the original story of King Kong. Although the story is set in the 1930s, it has definately been influenced by a contemporary view of society. Gone is the innocence of the 1930s. Carl Denham is a hateful character in this revision of the classic original, so much so that Captain Englehorn (who himself is more concerned about money than about his 'friend' Denham) attempts to strand him on Skull Island. Jack Driscoll, who is a snooty playwright instead of being the ship's first mate, has some sort of bond with Denham, but there is no way to see why. The way the characters are portrayed here, you don't feel any connection with any of them. There is no one that I want to see survive! It's hard even to feel sorry for Kong himself in this version. 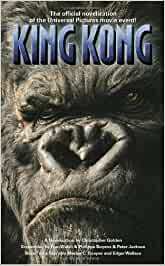 A 2 for the book as a stand-alone, but it goes into the minuses for killing what was so special about the King Kong story. 5.0 out of 5 starsKONG! THE EIGHTH WONDER OF THE WORLD! This book is a true masterpiece of modern film novels. It immediately captures the heart and mind of the reader with the characters exploits on the 1st page. Based on the 2005 film KING KONG this novelization tells of how a struggling vaudeville actress Ann Darrow journeys across the sea to the mysterious Skull Island to film a motion picture. On the way she will fall in love, face many dangers and meet Kong, a massive prehistoric gorilla with whom she forms an uncanny connection. Christopher Golden masterfully tells us the story of the movie. The movie's screen play is captivatingly designed from the 1930s edition by Peter Jackson, Accademy Award-Winning Director of THE LORD OF THE RINGS TRILOGY. Filled with many great characters including Carl Denham an obssesive movie director to Ben Hayes, the first mate of the ship VENTURE, this is a book to be treasured for ages.